3x Optical Zoom-NIKKOR (38-114mm) Lens provides exceptional pictures. This lens is built on a proud heritage of producing precision camera optics that deliver superb colour and razor-sharp results. New EXPEED image processor ensures high-quality pictures with stunning colour and sharpness. Nikon’s comprehensive digital imaging processing concept incorporates the know-how and the technologies acquired throughout our long history of photographic and digital imaging development. EXPEED is custom-tuned for COOLPIX and renders natural-looking pictures of incredible quality and quick response so you will not miss that special moment. Optical Vibration Reduction Image Stabilization compensates for camera shake to prevent blur and produce clearer, sharper results in lower light or unsteady conditions. In addition, the benefit of Nikon’s VR system extends to faster framing on the monitor and smoother action when using the movie mode. Slim, Stylish All-Metal Design slips right into your shirt pocket or purse! Not only is the camera easy to carry around, it is great to be seen with. Nikon’s beautiful wave-surface design and sweeping lines make it a camera that not only takes great pictures but looks great doing it. Auto adjusts up to ISO 3200 making new opportunities to take sharper, more natural-looking photos in lower light conditions. Wi-Fi enabled will support both wireless b and the faster wireless g standard. You can now upload and store your pictures on Nikon’s my Picturetown by simply connecting the included AC Adapter. The camera will detect your wireless network and begin the upload. You don’t have to sit at your computer anymore and wait! Your pictures will be uploaded safely and securely to your account on my Picturetown. Wireless my Picturetown allows you to view your pictures anytime, anywhere. View pictures on your Blackberry. Email and store (up to 2GB free, 20GB free until April30, 2008 with the Premium Account) pictures directly from the camera in Wi-Fi open-access hotspots with the new Picture Mail Button. Plus, receive six months of free T-mobile Hotspot service. One-Touch Portrait Button automatically activates In-Camera Red-Eye Fix and Face Priority AF to create stunning portraits. There is no more fumbling through menus or worrying about pressing the wrong button. With the One-Touch Portrait Button on the top of the camera, it’s as easy as a single press of one button to get a great portrait, without red-eye. Nikon Image Innovations include: In-Camera Red-Eye Fix, which will automatically look for and fix most instances of red-eye; Face Priority AF, Nikon’s face-finding technology, quickly finds and focuses on up to five faces in a group portrait; and D-Lighting which rescues pictures that are too dark for printing by enhancing the underexposed areas of the picture while not touching the properly exposed areas. All New Pictmotion lets you select your favorite pictures and combine them with music. There are five pieces of music pre-installed, and you can upload up to ten pieces of your own music to the camera! Add a choice of visual styles that match the mood of your photos and you can create an amazing slideshow with music—right in the camera. In addition, Pictmotion is now offering VGA quality so displaying your slideshows on a flat-screen TV will be more enjoyable then ever. 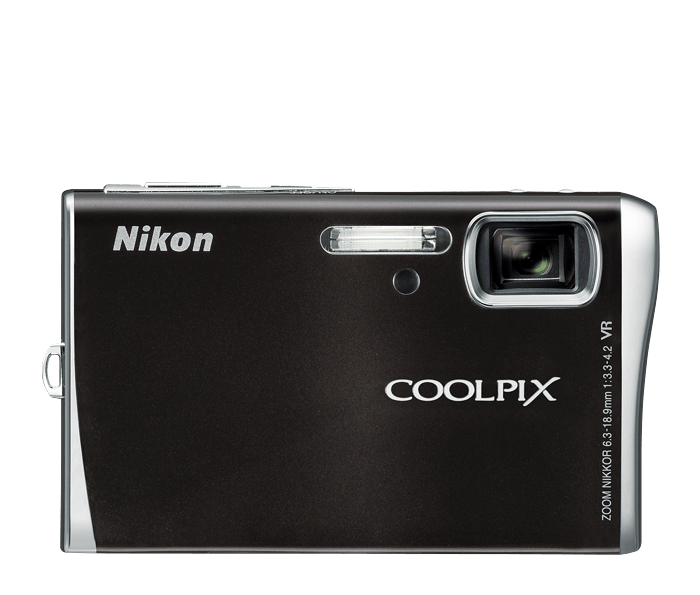 High Quality TV Movies with Sound are now just a press of a button away with your COOLPIX. Record TV-quality movies with sound whose duration is only limited by the available space on your SD/SDHC card. Connect your camera to your TV and you have instant home movies.